Manufacturers say goodbye to crumbs with Unipak's micro-flute linings. Frustrating, isn’t it, when you open a new pack of biscuits or your favorite wafers, only to find them crushed? With concerns for costs and the environment growing, manufacturers are continually reviewing the effectiveness and environmental impact of their packaging. However, when ineffective packaging forces customers to buy crumbs, confectionary manufacturers may lose both revenue and reputation. A viable option to widely-used polyfoils is microflute light-weight carton board or single-face linings, produced by Unipak sal in Lebanon. 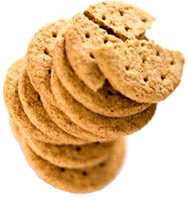 Used as internal packaging, E or B-flute corrugated lining is strong enough to keep biscuits, cookies, and wafers whole – the way customers like them best. Fluted linings for confectionary products are made of 100% recyclable, food-approved material. Available in brown kraft, white kraft, or brown / white kraft, linings may be printed in up to four colors. Rolls are shrink-wrapped and palletized. Confectionary manufacturers may request a quotation and samples of the inner protective fluting sheet at salessupport@indevcoexport.com. Established in 1967, Union Packaging Corporation (Unipak) is a fully integrated corrugated plant in the Middle East. Located in a 50,000 m2 facility in Halat, Lebanon, Unipak uses recyclable virgin and recycled top-grade raw materials to produce 25,000 MT of corrugated packaging products for retail, industrial and agricultural products each year. The ISO 9001-certified company is a leading supplier to the local market and exports to Europe, the Levant, and Africa.